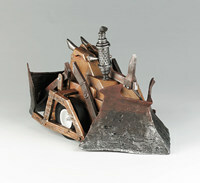 Mechanical mayhem, chainsaw catastrophe, damage and destruction marks the arrival of the much talked about Robot Wars toys. Those brave enough to venture behind enemy lines will be able to challenge each other to grudge matches, testing the power of the new radio-controlled and action toys. Toy makers, Logistix Kids Retail has confirmed that the robot replicas from the hit BBC 2 series, will be available in major toy retailers, including Toys R Us and Woolworths for Christmas 2000. Predicting the markets move toward interactive toys, Logistix Kids Retail has produced two radio-controlled house robots: Shunt and Matilda (RRP £54.99) and a host of action toys (RRP 9.99) to include the famous house robots: Shunt, Matilda, Sir Killalot, Dead Metal and Sgt. Bash as well as favourite competitor robot, Hypno-disc. Logistix Kids Retail plans to extend the range and introduce new additions in Spring 2001. "We have gone all out to replicate the robots and have spent huge amounts of time and money throughout the design stage to get them just right. We think they will be as big as a hit as the show itself," said Logistix Kids Head of Retail Vicky Myers. In research commissioned by the company, children said they wanted a variety of accessories - to be able to create different battles and to make their game more like the TV show. Logistix Kids Retail has responded to this by offering a range of tough and testing accessories and interchangeable weapons. Some of these have never been seen on the TV show and have been designed especially for the use with the toys. 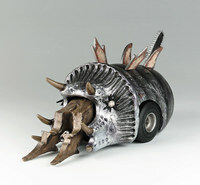 The Robot Wars series organisers have been so impressed with the toys that they have decided to incorporate the new designs into the actual house robots. The launch follows the cult show, which returned to our TV screens in September. Now well into its forth series Robot Wars goes from strength to strength, attracting upwards of 6.5 million viewers every week. Q: WHAT ARE THE NAMES OF THE TWO HOUSE ROBOTS PICTURED?? ?